Squat racks are used for freeweight barbell exercises. They are also called half racks, in comparison to power racks, which are larger and have more parts. A half rack can be preferred for several reasons: it usually saves on space and is easier to move if necessary. They are also frequently used in group environments where people are spotting each other and have no need for safety arms on the rack. Unlike power racks, half racks do not enclose the barbell with 4 uprights. The barbell is used off the front of the rack only, and only some models include safety arms to catch a failed lift. Folding wall mounted squat racks are the ultimate space saver. The ones below are the traditional freestanding squat racks. * With the BD-18 rack you can detach the uprights and use them as independent squat stands and/or store them away easier. Commercial racks are heavy beasts meant to hold up to abuse all day and not move too easily. Light commercial racks are not quite as heavy but are still good for some commercial use and well-respected by home users wanting good equipment. The whole “light commercial” classification for any type of gym equipment is based on the idea that it won’t be used all day long, every day. But for something like racks where there really aren’t many moving parts to wear out, it’s mostly a matter of knowing what people will be using it, so if you know your clientele won’t be abusing it or won’t be lifting heavy enough to do damage, a light commercail rack can be fine under constant use for years. Home racks are lighter and may require more careful use or lighter loads. For example, if you’re doing 300lb squats and walk the barbell hard enough into the uprights to re-rack it, or fall forward, the rack may tip. If you’re more careful then it isn’t such an issue. So it provides a good amount of safety, but not the ultimate safety of higher grade racks. The gauge is the thickness of the steel used to make the tubing. A bigger number isn’t better! It’s the opposite. The lower the number, the thicker and heavier it is. Larger tubing sizes like 2″x3″ add strength and stability. So larger tubing and heavier gauge naturally go together to make a rack more heavy duty. 14-gauge is around 2mm thick, while 8-gauge is over 4mm thick. A rack with 11-gauge 2″x3″ tubing is considered very good, even for experienced athletes lifting a lot of weight. You see them often in university weight rooms and commercial environments. The taller it is, the better it will accommodate tall users. For shorter users, it really doesn’t matter, as the bar catches are usually height-adjustable. Tall users can figure they need a rack at least 1ft shorter than their height, assuming they won’t be holding the bar higher than their shoulders. So a 7ft tall person will need at least a 72″ (6ft) tall rack, and a 6ft tall person will need a 60″ (5ft) tall rack. The heavier, the more stable it can be, but the stability also depends on the design, such as the spread of the feet and the gussets design, so this isn’t a hard and fast rule. The weight is based on the steel tubing used, as well as the size and design of the rack. If you’re going to be moving it around, the weight is a consideration. 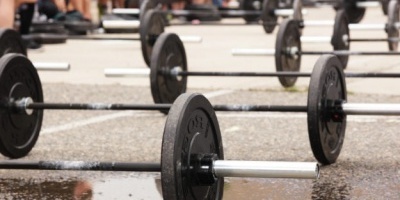 All power racks include these, but only some squat racks do. Set them at the bottom of your range of motion and they will catch the barbell if you fail a rep or miss the bar catches when re-racking the barbell. It’s a valuable safety feature. The length of the safety arms also matters. 24″ is fantastic, because that’s long enough that you won’t miss the safety arms if you fail a squat as long as you’re more or less standing in the right area. 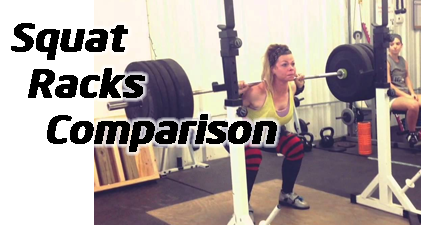 16″ is ok, but you have to be more careful in squats. 16″ or even 12″ long safety arms for bench pressing is fine. Anything less than 16″ for squats isn’t good. This is the space between each height setting for the bar catches and safety arms. The smaller the spacing, the more precisely you can set the height. If you will only be squatting or doing other standing exercises with it, this doesn’t matter much. For bench pressing, people get picky about hole spacing in regards to the safety arms. The reason is that when you’re doing bench presses, the safety arms should be set just below your chest height, so that if you fail a rep you can still set it down on the safety arms and wriggle your way out. If you set the safety arms an inch too high, you’re going to bang into them at the bottom of each rep, while if you set them an inch too low you’re going to crush yourself before they catch the failed rep.
2″ hole spacing is ideal and the best you can really find. 3″ spacing is larger than ideal for bench pressing. You could get lucky and one set of the 3″ spaced holes is exactly where you need it. If you find you can’t set your safety arms in just the right spot, that’s ok, you can fix it. Lay down some rubber mats in the rack until your bench rises up to just the right height in relation to the rack. We purposely didn’t add this attribute in the table. Manufacturers come up with his number how ever they want, so it’s only useful in making relative comparisons of models by the same manufacturer. The Grade and Steel Tubing Size tell you what you need to know. But to give you a rule of thumb, if you have the barbell loaded to over 300 lbs on a Home grade rack you should think about upgrading to a Light Commercial rack, even if it’s just for the extra stability. If you’re doing 500+lb squats or presses, you should already know much better than me what kind of rack you need. Keep in mind, the safety bars on any rack are supposed to bend from a heavy enough shock load in order to save your expensive barbell. And this is assuming a very strong barbell. 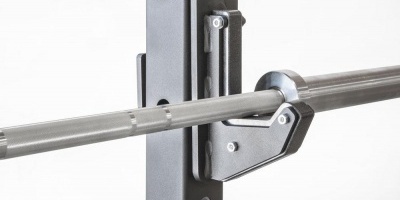 If you drop a heavily loaded barbell onto them from a couple feet high, ie: a failed squat you got nearly all the way up and drop from near the top of the rep, you would be better off buying another $100 pair of safety bars than replacing a much more expensive barbell. However, the safety bars should NOT fail you from a softer shock load where the bar has traveled less than a foot in freefall, like failing a bench press or at the bottom of a squat where you fail to get out of the “hole”.